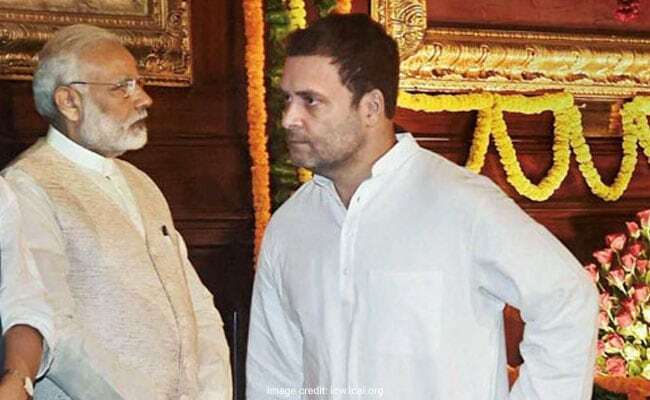 The BJP, which ruled Gujarat for 22 years and is seeking fifth straight term, said Rahul Gandhi had "violated" the Model Code of Conduct out of "desperation". New Delhi: An interview of Rahul Gandhi, aired by a local television channel in Gujarat ahead of today's election, became the new flashpoint between the Congress and the BJP on Wednesday. As the Election Commission issued a notice to Mr Gandhi - saying he "prima facie" violated the model code of conduct - following a complaint by the BJP, the Congress asked for action against Prime Minister Narendra Modi and BJP chief Amit Shah for what they said was similar rule-breaking. Senior Congress leader Randeep Surjewala also alleged that Gujarat Chief Minister Vijay Rupani and the state BJP chief Jitu Vaghani had issued threats to journalists for airing Mr Gandhi's interview. The BJP said it had advance information that Mr Gandhi's interview, in which he spoke of Gujarat elections, was to be aired on Wednesday and it had informed the Election Commission. The Model Code - guidelines for political parties ahead of elections - bars them from commenting about the election for 48 hours before polling. Under it, the media is also not allowed to broadcast anything related to the elections in that period. The campaign for the phase two of the bitterly-contested elections in Gujarat had ended on Tuesday. The BJP, which ruled Gujarat for 22 years and is seeking fifth straight term, said Mr Gandhi had "violated" the Model Code of Conduct out of "desperation". "The Congress is so scared and Rahul Gandhi is desperate to save his face. That is why he violated the Model Code and gave interviews," Union minister Piyush Goyal told reporters in Delhi. "We don't think such interviews are allowed in the 48 hours prior to polls. We have never given such interviews," he added. Earlier on Wednesday, the Election Commission had asked television channels to stop airing the interview and directed the state election body to file police cases against violators. Later in the evening, the Commission asked Mr Gandhi to send his response by 5 pm on December 18 - the day votes will be counted. Meeting election officials in Delhi late in Wednesday evening, the Congress said the Prime Minister and Mr Shah have both violated the model code. PM Modi has given a speech at FICCI and Mr Shah gave an interview to a television channel on Wednesday. Mr Surjewala said, "We are on record to say the Gujarat chief minister and Gujarat BJP chief are calling up television channels and threatening them. Union minister Piyush Goyal has also said that cases will be registered against those airing Gandhi's interviews," he was quoted as saying by news agency Press Trust of India.